Tiny, Accurate and Robust Compression Measuring only 8mm in Height! Very Compact – At Ø15mm x 8mm height it easily fits into the smallest of spaces. Save on Installation Time – Ideal for retrofitting into existing designs. Optimum Performance Guaranteed – With its integral load button. Ideal for Compression Measurement with Limited Space. The CDF subminiature button load cell is designed for compression measurement applications where the absolute minimum of space is available for transducer mounting. 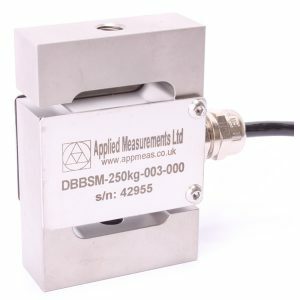 With capacities from 500N to 2000N available measuring just 15mm in diameter and 8mm in overall height, the CDF is the smallest standard button load cell that we offer, however we can create smaller customised versions if required. If you need to measure lower or higher forces, the CDFM3 miniature button load cell is available in capacities from 0-100N right up 0-20kN and is slightly larger at 30mm diameter and 12mm in height. The CDF subminiature button load cell is ideal for retro-fitment into industrial machines and process systems for monitoring and control purposes, or for incorporation into new machine designs. Below is a published sensor application paper that shows you how the CDF subminiature button load cell could be used in a specific application. See our published sensor application articles page for many more. By Christine Dahl, Øyvind Sandbakk, Jørgen Danielsen and Gertjan Ettema, Centre for Elite Sports Research, Department of Neuromedicine and Movement Science, Faculty of Medicine, Norwegian University of Science and Technology, Trondheim, Norway. Front. Physiol., 21 February 2017. Available under a Creative Commons Attribution 4.0 International license.